As an additional cost to play this operation, spend click. Place up to 2 advancement tokens on a card that can be advanced. He signed for it, hand shaking in anticipation. No MWL Entries for this card. No rulings yet for this card. 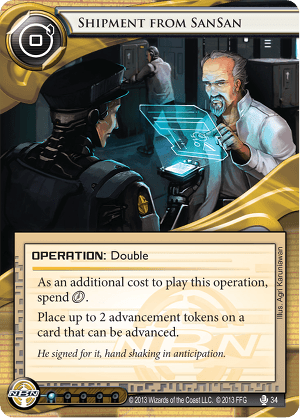 Sure, it's not strong as a pure econ card, but it's worth noting that it's paying you for something you'd do anyway, so drawing it is like clicking for 2 with a delayed reaction. Two other factions have similar econ cards; Beanstalk Royalties pays you 2 extra the next time you want to click for a credit. Green Level Clearance pays out when you want a card. Additionally, there are shenanigans. Using it to fast advance with Efficiency Committee counters is one, but there are others. This lets you advance even when you're broke, so you can still Fast Advance with Astro counters or a rezzed SanSan City Grid even after an Account Siphon or other econ denial attack. It also offers a sneaky way to beat Clone Chipped Clots because you can play this and immediately score before the runner's paid ability window. Finally, this finds its way into some Power Shutdown combo decks as Accelerated Diagnostics can play it out for two advancement tokens without spending an extra . I wonder, if this card is really worth playing... If you just advance normally, you spend 2 and 2 for 2 tokens. By using this card, you spend 2 and 1 card (worth a ) for 2 tokens. In other words, you pay 1 to get 2 once. Other economy cards either allow trading 1 for 2 multiple times or you get even more than 2 if it only works once.